Years ago, my sister-in law used to send us these cookies in a Christmas care package. It took a little bribing, but she eventually shared the recipe! 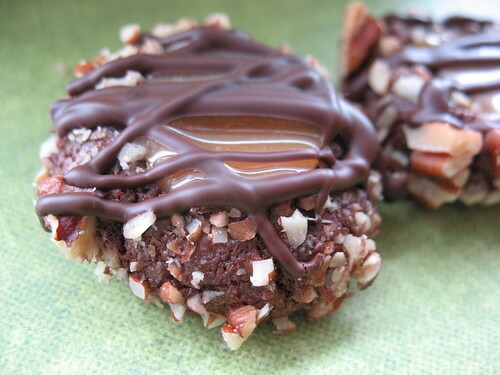 These remind me of Turtles chocolates, with a chocolate based cookie rolled in pecans, then filled with caramel and topped with more chocolate. They are a teeny bit fiddly, but oh SO worth it. Make them for your family, tuck into a basket for end of the year teacher gifts, or ship them to someone special. Either way, you'll be loved if you do! In a bowl using an electric mixer, cream butter and sugar together. Add the egg yolk, milk, and vanilla; beat well. In a separate bowl, sift together the flour, cocoa and salt. Blend with butter mixture until it just comes together in a dough. Scrape the dough out onto the counter and bring together into a disk shape, then wrap in plastic film and chill in the fridge for an hour. Pre-heat oven to 350 F. Line your cookie sheets with parchment paper and set aside. Set up, assembly style, a small bowl with the reserved egg white, and another bowl of the chopped pecans. Shape dough into 1 inch balls, dip in egg white, and the dredge in chopped pecans. Set about 2 inches apart on cookie sheet. Press your thumb in the center of each cookie to make an indentation. While the cookies are baking, in a small saucepan stir together the caramels, whipping cream over medium low heat. Keep stirring while the caramels melt, until it's all smooth. Set aside until you bring the cookies out of the oven, but you may need to heat it up again on low to keep it runny enough to spoon into the cookies. Bake about 10-12 minutes until mostly set, but they will still have a little give. When you remove them from the oven, press your thumb in the center again to re-form an indentation. Yes, it's a bit hot but you can do it! Spoon 1/2 tsp caramel into the center of each cookie indentation, and allow to cool. Be careful not to get the caramel on yourself, it would burn badly and be sticky to get off. Melt the chocolate and shortening together in the microwave on low. Drizzle over the cookies and then allow to set.